Learn how to write VBA macros to add, edit and delete data in Access, SQL Server and other databases, using something called ADO. This blog is part of both a complete Excel VBA tutorial and a complete SQL tutorial. 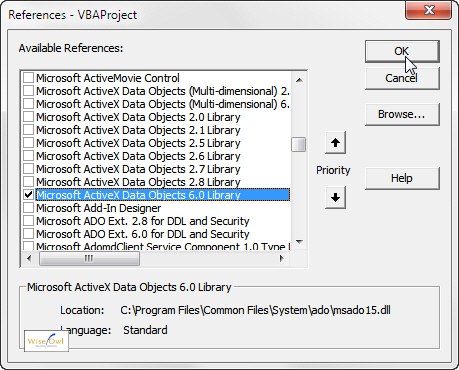 To link to data from within VBA, you will usually use the ActiveX Data Objects object library (ADO to its friends). If you're writing VBA within Access, you may well prefer to use DAO (or the Direct Access Objects library) instead. You can Google ADO or DAO for more details. Check the box next to the latest version of Microsoft ActiveX Data Objects that you can see, and select OK.
Make sure you tick the box next to the library, rather than just selecting it in the list. Which Version of ADO should you Use? There are 7 different versions of ADO in the dialog box shown above - which one should you use? The short answer is: the highest version number. For more information on different versions of ADO, see this Microsoft ADO version history page. Functionally ADO 2.8 and 6.0 are the same: the only difference is that 6.0 was provided for Windows Vista and later operating systems. Now that you're referring to the ADO library, it's time to learn a little about esoterica such as connections and recordsets.